I distinctly remember making this alfredo sauce recipe in a massive batch for a group of guys/girls/myself around 3:30 am. 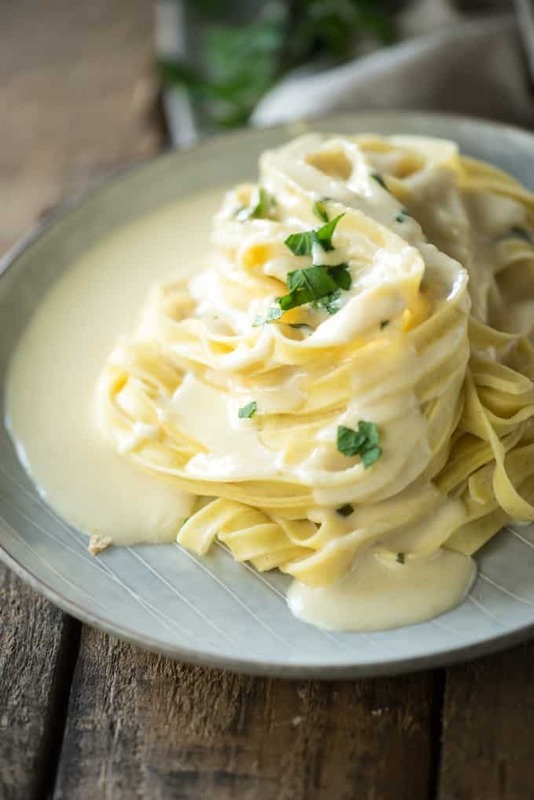 Let me assure you that this alfredo sauce recipe tastes even more amazing when made in the middle of the night after you’ve been out. It also ushers in the need to immediately sleep. 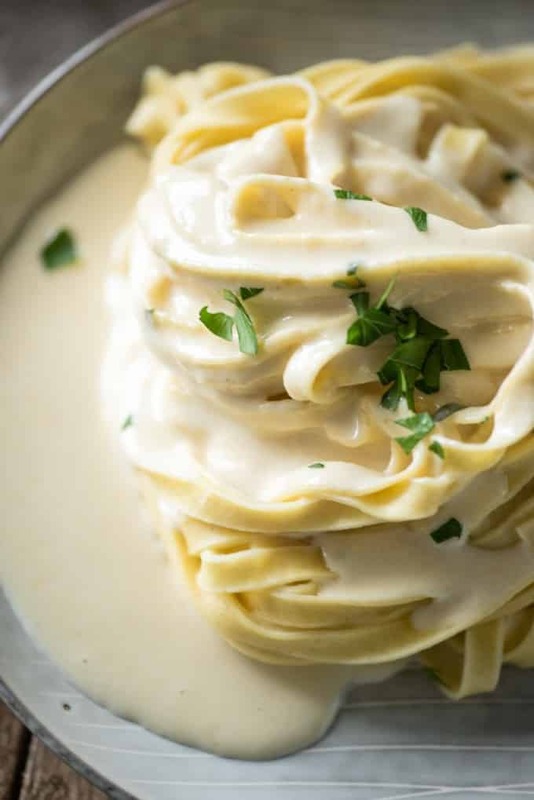 The alfredo sauce is arguably the best reason to to go Olive Garden, period. Dipping those garlicky, salty breadsticks in a dish of it….. Wow, look at that, my whole mouth just started watering. Quick side story about Alfredo: Dave and I could not agree on a boys name before J was born. Actually, he didn’t even have a name for the first two hours he was in this world, because we still couldn’t agree. Evidently he wanted to be named Giovanni or something like that, so because we are SO funny, we told everyone that we decided on the name Alfredo- and that was what we called him for the rest of my pregnancy. Like I said, we are SO funny. This is a recipe is made with a little bit of cream cheese, which may sound strange (and no, not authentically Italian), but it’s really responsible for the extra creaminess that you get in the sauce. There’s always a Monday morning quarterback in the comments here or on Pinterest telling me that they used to work at Olive Garden and they don’t use cream cheese. It’s only supposed to taste like Olive Garden, not be made just like they do. I feel I need to stipulate that. 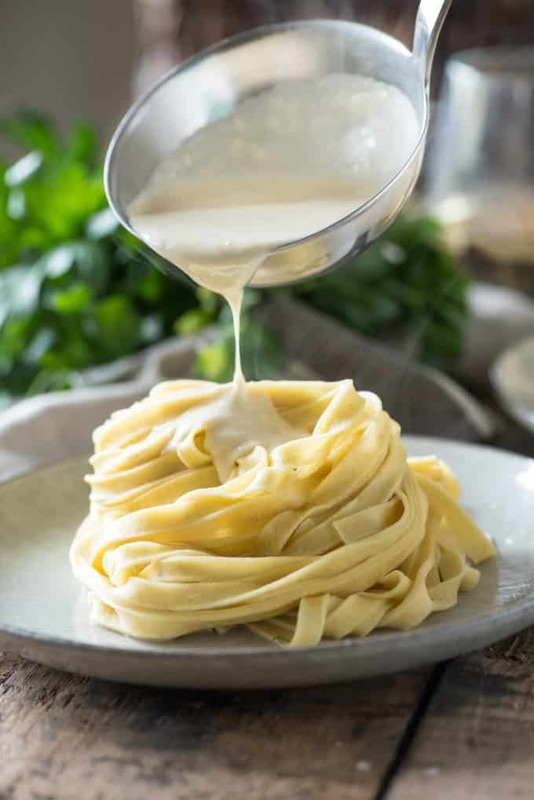 Can you make Alfredo sauce without heavy cream? I used to make this with a combination of heavy cream and fat free half and half. While I am sure that it does majorly slash the calories, I have gotten away from it in recent years and just use heavy cream now. You definitely still CAN sub half the cream for fat free half and half (or even regular half and half). The result is definitely less rich and a little thinner, if that sounds like more of what you’re going for. Honestly, this Alfredo sauce is good either way. I mean, its Alfredo sauce. You really can’t go wrong. 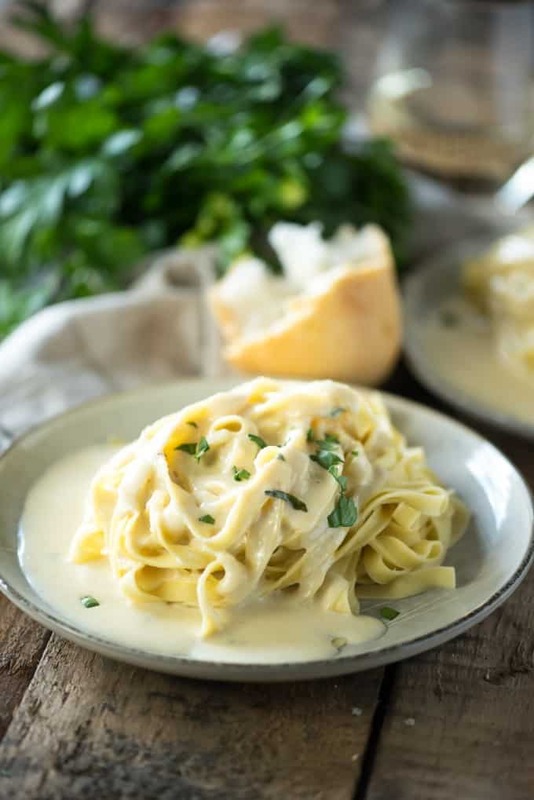 What can you add to Alfredo sauce? Man, just about anything!! It’s so versatile. When I used to make this once a week, I liked to use it with whatever I had in the fridge- grilled chicken, spinach, asparagus, mushrooms, prosciutto, broccoli, shrimp, etc. The possibilities are endless! I use it in my Chicken and Spinach Manicotti and my Million Dollar Lasagna too! If you’d really like some extra credit, try making your own pasta. I use my Kitchenaid Mixer and pasta cutters to make fresh fettuccine. Totally worth the effort! 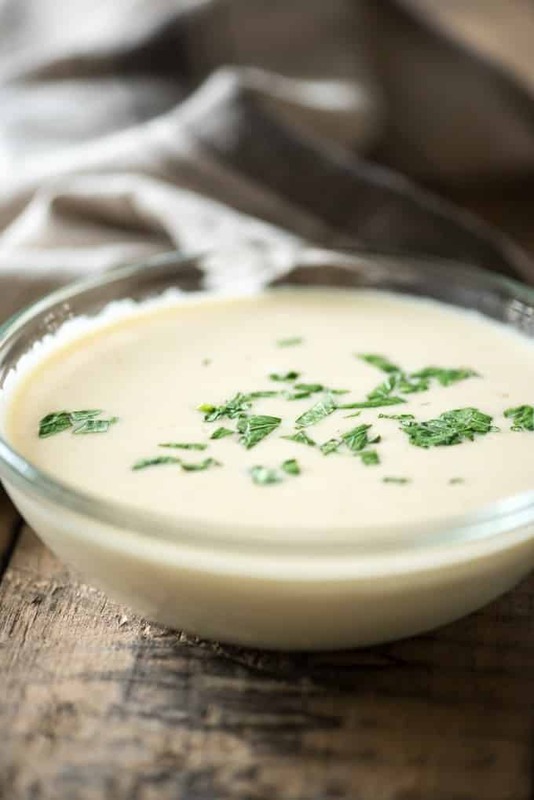 This Homemade Copycat Olive Garden Alfredo Sauce is a fast and easy dinner, and even better than the original! 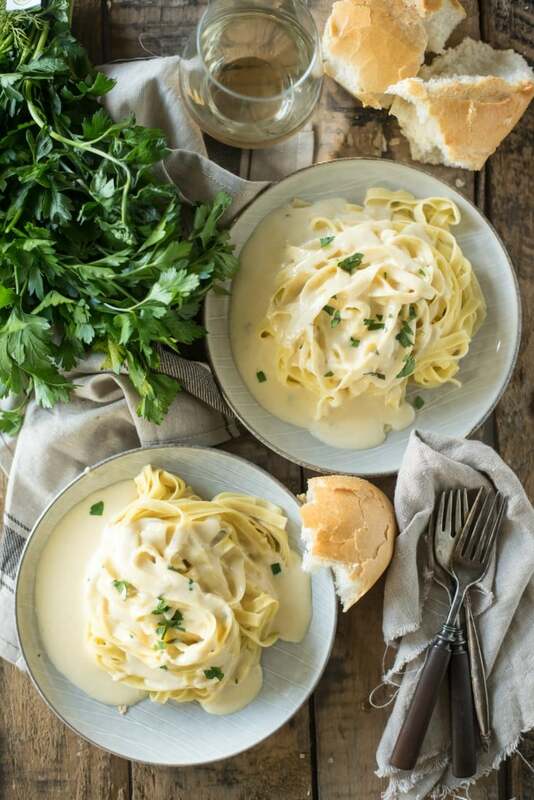 This alfredo sauce recipe is made with cream cheese for an extra creamy result. Whisk in the garlic powder and parmesan. Season with a small amount of freshly ground black pepper. Simmer, stirring often, until the sauce has thickened to a creamy consistency. Serve immediately. You can also use all cream, or ready-grated cheese in this recipe. By T you mean tablespoon right? I would say it makes enough sauce for 3-4 servings of pasta, depending on how “saucy” you like it. This is usually how much I make for my husband, toddler and myself. Anything more than that, I’d suggest doubling it. Any suggestions for Olive Garden-esque breadsticks to accompany this sauce? In the frozen garlic bread section of your grocery store ‘New York Bakery’ has similar ones. Those are the ones I buy!! Just made the sauce and it turned out fantastic! Very quick and easy. I made it for my 3 roommates and I and even had extra (we were stuffed!). I added some basil and oregano seasoning for taste and made it very tasty and flavorful. Thanks for the recipe Jacqueline! I am sure this tastes amazing, but I need to correct the recipe. I worked at the Olive Garden for 6 years and I can assure you that it does NOT have cream cheese or 1/2 & 1/2 in it. I don’t have half & half on hand can i sub for anything else? Milk maybe? Do you have any cream? That would be my next suggestion, and what I’ve started to use in this recipe mostly, actually. I’d be fearful that you MIGHT end up with a somewhat grainy sauce with milk. You could try it, maybe increasing the amount of cream cheese as well? I have heavy cream but no half&half. any recommendations on a substitute ? Looks delicious! I know my kids and husband would love this recipe. Yummy nummy! I love the video and this recipe! This recipe looks great! And I love the gif! This looks so easy to make- I can’t wait to try! I donot have fresh parm cheese,what can i use as a sub? I would probably cook the chicken separately. Rotisserie chicken shines here! You can check out the Loaded Alfredo recipe and the Chicken Spinach Manicotti for other ideas. I hope you like it (but I know you will!)! I made this for dinner tonight and it was AMAZING! My whole family loved it! I only have shredded Parmesean that you buy in a bag? Can I use that? What if I only have shredded Parmesean frm the bag? I will have to try this. Looks so yummy! And my side note: to close people down who had name ideas for our soon to be born daughter, we told them we already had the name. Elvira Margarita. No body would mess with a girl with a name like that! This made me chuckle, thanks for the laugh! Just made this and it is super tasty! My new go to Alfredo! Hi! I’m confused. I found this video on Facebook and it looks delicious. Your recipe calls for 4 Tablespoons of butter which is 1/2 stick. In the video, however, you use a WHOLE stick of butter which is 8 Tablespoons. Did you double the recipe for the video? This is hands down my favorite Olive garden dish (and their Parmesan Zucchini Bites) but your copycat is perfect!!! Now I can make it at home and it tastes just the same as OG!!! I would never have thought to add cream cheese, but it totally works! Talk about a knockout weeknight meal! That sauce looks so good! I wish I had it in front of me! omg I can’t even imagine going out for a fun night of drinking and coming back to eating this!!! that what I would call a perfect night in my college years! This looks so delicious! My husband and I are big fans of alfredo pasta. Love the addition of cream cheese for extra creaminess. Saving this recipe! I put the ingredients in and I came up with almost double the calories for 4 servings. Why is yours only 369? Thanks. I’m unsure, the nutrition is calculated automatically by my recipe card. I made this and it is my favorite. The taste is soo good. The texture is creamy and it does taste like Olive Gardens. This is in my difficiation a keeper!!!!. The recipe says to serve immediately. Can this be refrigerated for later? This is one of those things that is definitely best served when its made. Butter and cheese sauces are notoriously challenging to reheat. If you must, I recommend heating it on the stove, starting on low heat, so that it doesn’t break. The microwave will not be your friend, it will separate out. I have made this in the past my favorite go to recipe! It’s the only one I make. Perfect, and way easier than I thought it would be! This was a hit with my entire family, thank you! I love how easy this is to make! SO much better than something from a jar! Whoa, your recipe is spot on! So rich and delicious! LOVE it!!! So what did you end up naming your son after all?